Roe is so nutrient dense that I dare say it’s a superfood; hence, my desire to love their flavor. They’re reputed to have: vitamin A (in the best form: retinol), B vitamins, tons of vitamin D, vitamin K2, magnesium, phosphorous (good for your teeth), vitamin C, astaxanthin, selenium, zinc, omega fatty acids, iodine, and more. See? It’s basically a superfood, especially when you don’t even need to consume a lot to get these precious nutrients. As you can imagine, I want this in my family’s diet. For Kamea, my three year old, it’s no problem. She took to them right away, as most young kids do (same goes for offal like grass fed liver and heart – kids love ’em). Greg, a fan of fish, and myself… well, like I wrote above, it was a bit intense for us. That wouldn’t stop us from consuming them though because they’re worth it. Plus, I’m pretty sure that if I keep consuming them on a very regular basis, I’ll end up liking them as I did with my story of sardine-NOT-love-at-first-taste. That’s often the nature of foods. Have them 15 to 30 times and you should start liking them more than when you first tried-and-didn’t-like. That’s the theory at least. There are two other foods, sardines (mentioned above), where I did not like them at first. Liver is the other. However, I now have a loving relationship with sardines (and they love my body back). Liver, that was more tough to like, but I now have two tried-n-tested recipes that are fabulous. So, am I acquiring the taste for them or did I craftily come up with really yummy recipes to enjoy? Does it matter? Not in my opinion… so here is a crafty way to enjoy wild caught salmon roe. 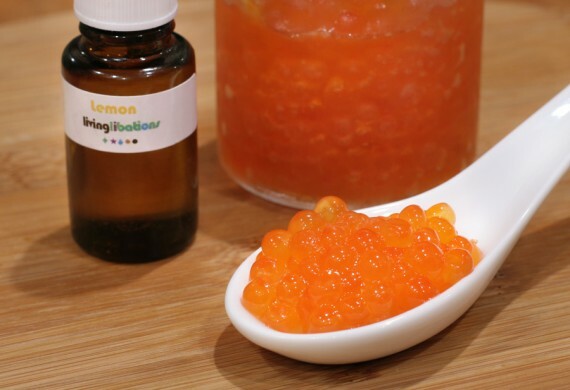 For the past year when we ate our wild caught salmon roe Greg and I took a wood spoon out, filled it with roe and either 1) squirted lemon juice on it and basically plug-n-chug (take them like a handful of vitamins with no chewing and just swallow with water). 2) Same as number 1 but drizzling a bit of coconut aminos on them (like a soy sauce but without the soy). 3) No lemon or coconut aminos, but just spoon them in the mouth and swallow with water (no chewing). No matter which of the three we chose, it was pretty painless and ended up only being mildly fishy. But, not anymore. I have a magically tasty way to take wild caught salmon roe where it’s not fishy, by pairing them with Organic (high quality!) Lemon essential oil. I still put them on the wooden spoon (don’t use metal as I’ve heard it alters the taste), and I still chug them like a handful of supplements, but when I do it with only ONE DROP of high quality organic lemon essential oil it’s actually pleasurable and delightful. Dare I say… refreshing? I tested it with my mom, too, who can’t stand fishy things. She was happy to report that she didn’t detect fishiness when taking them with the lemon oil. So, while Kamea is happy to gobble them up plain, I will swallow them down with Living Libations organic lemon oil with a smile. The organic lemon essential oil from Nadine Artemis at Living Libations is exquisite and I recommend it. Her essential oils are beautiful. I use the the lemon for many different things (aromatherapy, home cleaning, beauty, wild caught salmon roe, enhancing water and tea, and to seriously boost the lemon flavor in salad dressings and these Sunshine Muffins). It’s brilliant and I buy big bottles when I get mine.